This mathematical bottle opener is sure to become an operational constant when you're seeking liquid inspiration. It's the brilliant creation of Brian Johnson, a designer and engineer who bridges the worlds of creativity and precision craftsmanship. The hefty steel form is calculated for optimum leverage, solving stubborn bottle tops with near-infinite ease. When not in use, it becomes a smart, sculptural accent or paperweight. For mathematicians, teachers and other brilliant minds, using anything else would simply be irrational. Made in the USA. wipe clean with a damp cloth. dry immediately. steel will develop varying patina over time, giving your piece a rustic look and unique character. It was such a great gift the person I intended it for. Drinker and a Math whiz! it's a "bullseye" / good job ! I purchased this a few months ago for a math professor friend who is retiring. Now that I am about to wrap it, I see that it has rust over much of the surface. It was boxed the whole time, so I can't imagine why it would look like this. Delivery was great. It was a little pricey, but it was my choice to buy it so I can't complain too much. Great conversation starter. Can be used as an opener or a trivet - or just as a conversation piece! Bought this f rom someone named "Pi"
The price and quality of workmanship do not match. I will be sending this back. The person I am giving this to is a manufacturing engineer. Their quality department would never have approved this quality of workmanship. Perfect gift for our adult daughter dubbed with the nickname "Sweet Pie" by her dad when she was a toddler. The name shortened to "Pie" over the years. This gift has great sentimental value & a hint of humor. 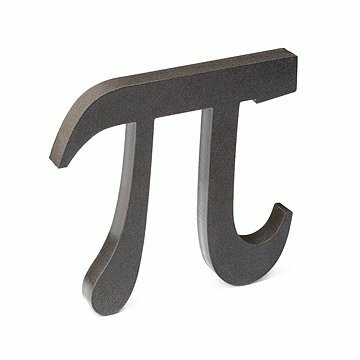 This steel bottle opener is shaped like the letter Pi, and makes a handsome paperweight or geeky art piece when not in use.